Welcome back everyone, to day 4 of our Stamp Highlights! We end this month's Stamp Highlight series with Zenith Borders. We just love what everyone did with these patterns! 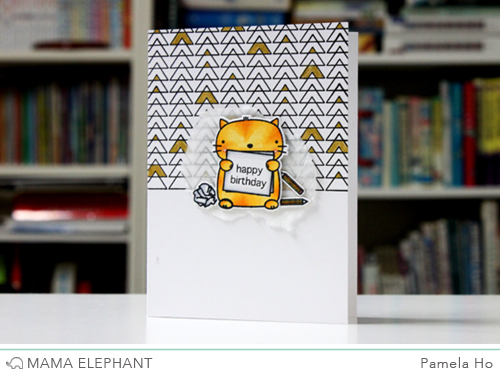 Geralyn created this cool birthday card using one of the backgrounds from Zenith Borders. 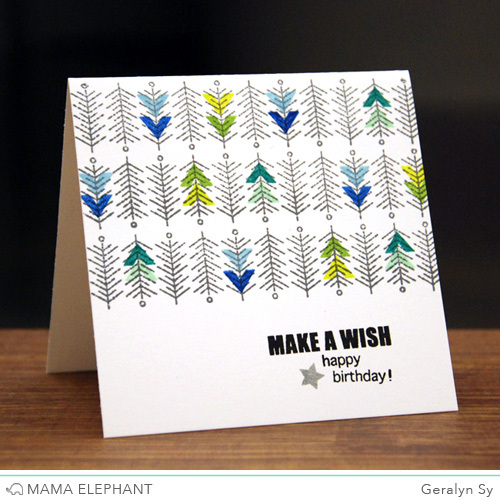 She easily customized it by adding stamped details with the single chevron stamp. Laura used one of the border images and several of our pigment inks to create this fun background. She partially die cut an opening to frame a sentiment from the Good Times stamp set for a "rockin' awesome" birthday card. Pamela stamped the overlapping triangles repeatedly and coloured some of the space with gold paint. We love the ripped up tissue paper backing the kitty from Three Amigos! Elena used our Piggy Bank ink to create her background. While the ink was still wet, she smudged the design for a tone-on-tone look. We love that! If Elena sent us this card, we would forgive her anything! 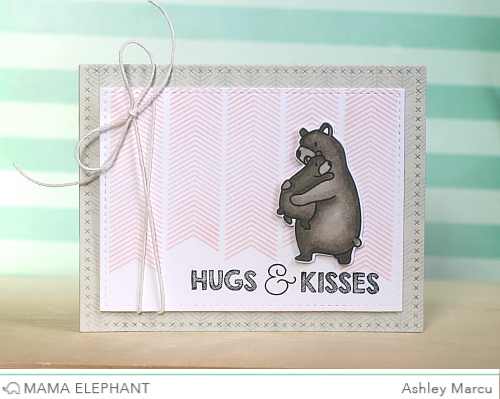 Ashley created this sweet card with two of the backgrounds from Zenith Borders. One serves as a background for the bears while the other adds great texture and interest to the tone on tone large panel. Nichol created a background for her card using several ME pigment inks with the Zenith Borders stamps and completed the simple design with the Thanks Script Creative Cuts die inked in the same pigment ink colors. These are so pretty. Loving the background images! These cards are wonderful! The Zenith Borders are so versatile, really cool. Wow, I couldn´t imagine such amount of uses of these stamps!! They are fantastic! This is such a fabulous stamp set, and I love what you and the DT girls have created with it! Gorgeous cards, ladies! Everyone's cards are amazing! This is such a fun and unique set, love it! Really versatile border set--everyone's cards are fabulous! I love these background stamps. They are so different. They'll be on my shopping list. Gorgeous cards - love this set!